When he was a boy, Casey Simmons spent a lot of time building model airplanes. 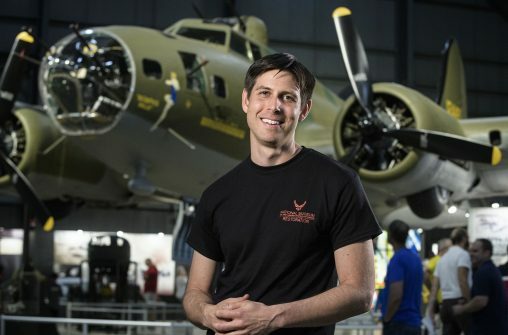 His favorite was the Memphis Belle, one of the first B-17 heavy bombers to complete 25 combat missions during World War II without losing a single member of its crew. The plane, immortalized by Hollywood, would become what some consider the most famous Flying Fortress in history. And while Simmons — a Wright State University alumnus — built many model Memphis Belles as a kid, little did he realize he would someday help restore the real thing. But he spent the past 11 years doing just that. The fully restored Memphis Belle was unveiled May 16 at the National Museum of the United States Air Force in Dayton and has since dazzled thousands of visitors, who throng to the olive-skinned warbird and take in the machine guns poking out of its turrets and the leggy belles painted on its nose. Simmons vividly remembers the day he first laid eyes on the airplane, when he was a volunteer at the museum. Not only did it happen, but it happened in a big way. Simmons has done restoration work in virtually every nook and cranny of the aircraft. He has crawled into the wings. He has lain inside the engine fuselages. He has replaced rivets. And he even painted one of the two Memphis belles on the nose. Simmons grew up in Dayton. His father worked as a mechanical engineer and his brother was also a mechanical engineer and a Wright State graduate. After Simmons graduated from Colonel White High School in 1998, he came to Wright State on an academic scholarship and majored in anthropology. “It seemed like a really good fit for me because I was really into archaeology, which is one of the focuses in anthropology,” he said. Simmons, whose wife currently works at Wright State as the assistant director of academic advising, credits the university with giving him the fundamentals and teaching him that success is built on hard work. “It’s a set of skills I learned that still sticks with me today,” he said. After graduating with his bachelor’s degree in 2003, Simmons worked as a supervisor for Wright State’s archaeology field school. He then got a job as a ranger at the Dayton Aviation Heritage National Historic Park. While Simmons was working at the park, he began volunteering at the Air Force museum in 2007. He started out sewing upholstery. Then there was painting and sheet-metal work. Later he was hired on as a student so he could go to school and become licensed as an aircraft mechanic. In 2008, he became a full-time permanent staffer and currently works as a restoration specialist. 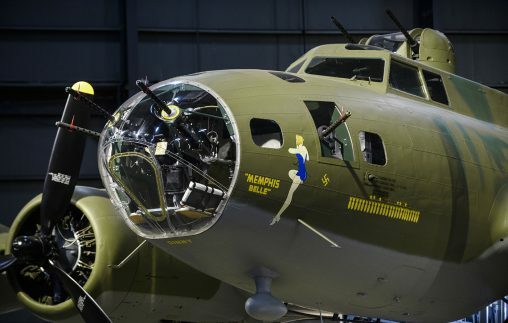 Casey Simmons has done restoration work in virtually every nook and cranny of the aircraft, including painting one of the two Memphis belles on the nose. But Simmons’ restoration career has been defined by the Memphis Belle. The airplane, which was trucked from Memphis, Tennessee, to Dayton in 2005, was hardly ready for the big dance when it arrived. The plane was still in pieces when Simmons first saw it. The wings were in sections, as was the fuselage. “It didn’t look like a B-17 unless you really knew what you were looking at,” Simmons said. The Belle, which appears as it did on its final mission, was painted with an original World War II style of paint and the exact color, which took mixing and blending different colors 25 times to achieve. In addition, the plane’s tail had been shot up during one of its bombing runs and the new shade of green on the tail didn’t match that of the rest of the plane. So the restorationists had to replicate the mismatch. If something didn’t look quite right, Simmons would dig into the archives and review some of the historic photographs. During the unveiling at the museum, several descendants of the Memphis Belle crew thanked Simmons for his work.